You just don’t see artichokes at parties and I think that’s a shame. True, they are a little prickly and require some attention to be made properly presentable, but given how tasty they are, I think it’s worth the work. And if you take the time to grill them for a final dressing up, man oh man, how pretty they can look. With summer grilling and entertaining season in full swing, I offer up this crowd-friendly, make ahead grilled artichoke recipe for your consideration. You can steam and marinade these artichokes the morning of a party or dinner and then finish them in just a few minutes on a hot grill. They take about as long to warm through as you’ll want to rest a nice piece of grilled meat, so they’ll fit right into your prep schedule. Because artichokes are hearty you can also transport them right in their marinade bag to a park or grilling potluck and finish them once you are there. So instead of planning the same ol’ grilled vegetables or corn as a side for your next grilling party, may I suggest giving grilled artichokes a whirl. Your guests will be so impressed and you’ll be amazed at how much easier they are to prepare than you ever imagined. 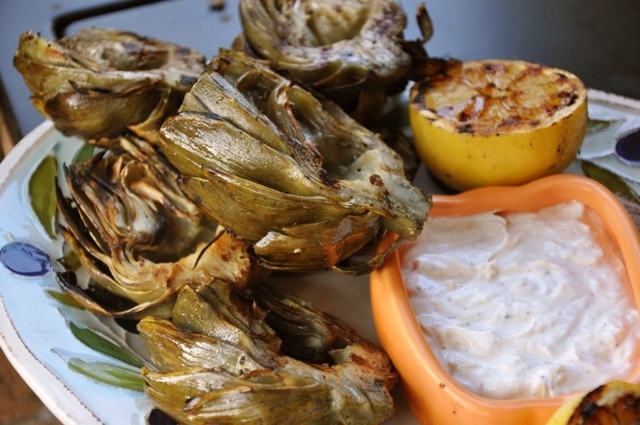 Surprise your guests with grilled artichokes that are fun and easy to eat. You can do all of the prep work in the morning and then toss the chokes on the grill for a final kiss of flame just before you serve them. Set the artichokes upside down in the steamer. Cover with a tight-fitting lid. Bring the water to a boil over high heat then reduce to a medium. Combine the olive oils, vinegar, rosemary, salt, and pepper in a small mixing bowl. Whisk to combine. Pour the marinade over the artichokes and seal the zip top bag or cover the glass dish with plastic wrap. Let artichokes marinade for at least 2 and up to 8 hours. Heat a gas or charcoal grill to medium high. Grill the artichokes for 4-5 minutes on each side or until they are warmed through and have pretty grill marks. Sprinkle with sea salt just before serving. If you’ve never prepped and steamed artichokes before and need a step-by-step pictorial guide, Cooking for Engineers has the best one I’ve seen. You can find lemon olive oil at many specialty grocery stores. My personal favorite is Lisbon Lemon Olive Oil from Stonehouse Olive Oils out of California. Otherwise blend 7 tablespoons of olive oil with the juice of one whole lemon as a substitution for the 2 tablespoons of lemon olive oil plus 6 tablespoons of regular olive oil the recipe calls for. For a pretty presentation cut a couple of lemons in half and grill them along with the artichokes. If you’d like a dipping sauce as well, mix a small container of Greek yogurt with the juice of half of a lemon, as well as salt and pepper to taste. You can also throw in a couple of tablespoons of chopped fresh Italian parsley for a bit more fresh flavor. Don’t forget to set out plenty of extra napkins because after swimming in the marinade and sunning on the grill these artichokes are juicy. Also be sure to place several leaf discard bowls around the table as well so folks don’t have to wrangle the remains of their artichoke feast on their dinner plates. I have to admit I used dried rosemary in this dish because I killed my rosemary plant and haven’t had fresh on had for a few weeks. You can of course substitute up to 1 tablespoon of fresh rosemary for the teaspoon of dried. Play around with the aromatics that you put into the artichoke steaming water. You can add thin slices of lemon, a bay leaf, or even a clove of garlic. You can also experiment with the flavors in the marinade. Try substituting your favorite red or white wine vinegar. Add chopped garlic or shallots to the party or even swap out the rosemary for thyme or another full flavored herb. You can double, triple, quadruple, and otherwise scale this recipe to your heart’s content. Make as many chokes as you need. It will also work with larger artichokes but you’ll need to increase the steaming time to as much as an hour for very large globe artichokes and you may need to double the marinade if you plan to use three large chokes. I personally like how smaller chokes look on a serving dish and how easy it is for guests to have half of a small artichoke to themselves. However, a couple of big artichokes on an appetizer table can lead to great group conversation as people stand about licking their fingers and wiping juice from their chins.